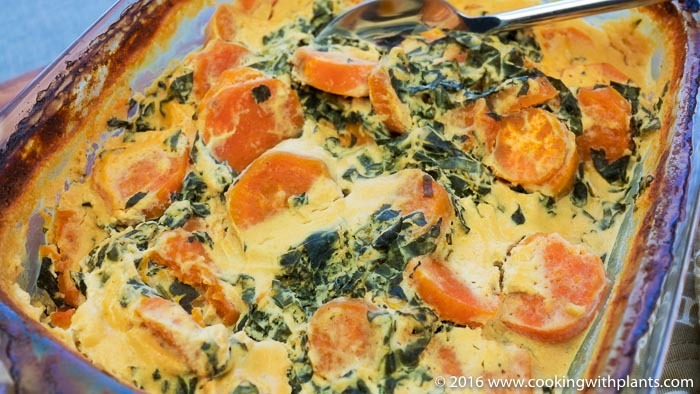 This “Cheesy” Sweet Potato and Kale Bake is reminiscent of a ricotta style bake, but without the dairy! It is so rich and creamy, you would never know that it is healthy or vegan! Loaded with the goodness of kale, this melt in your mouth dish is big on taste and big on nutrients… what a fantastic combination. Give it a go, I’m sure you’ll love it. Place sweet potato and kale into a 2 Qt/2 Litre size casserole dish (with lid). Next, place all of the cheesy sauce ingredients into a blender. Blend on high for a minute or two until smooth and creamy. Pour the cheesy sauce evenly over the vegetables, lightly sprinkle with paprika or nutmeg. and cover with a lid. If you do not have a baking dish with a lid, use some aluminum foil to cover it tightly. Bake in oven for 30 minutes. Check the sweet potato to check how well it is cooked through. Place back in the oven for 10 to 20 minutes until the sweet potatoes are cooked through to your liking. This looks delicious! Do you think walnuts would work well in place of the almonds? Thanks. Yes, walnuts would also work. Not seeing the tahini in the recipe – can it be made without it? I would prefer not to add to the day content. Thanks! You can leave it out if you want to but it does give it a bit of extra creaminess. Lovely flavour, thanks for my dinner. Didn’t have any blanched almonds so subbed almond meal, worked okay but i think the whole almonds may have made a thicker creamier sauce. Cooked this recipe for dinner and it was fantastic. I have only been following a vegan diet last couple of months and I must admit I did struggle the first month. As soon as I found your recipes it made it so much easier and I don’t feel like I am missing out on anything. You have made it much easier for me Anja and for a lot of other people so keep up with the good work! Congratulations on your good health and weight loss too! Fantastic! So glad you like it as much as I do Rivka! I followed the recipe but my sauce is not white but light brown (wrong miso ?) and I found it a little too liquid too. I’m not sure why your sauce went light brown. Possible if you used darker miso. As for the liquid, did you use the metric or the imperial measurements? I just took it out of the oven! This sauce is soo delicious! I didn’t have cale, actually I con’t know where to find cale in Greece! But I added some zuccini and some carrots and also some nutritional yeast to the sauce. Thank you for the great recipe! Ioanna, you can find kale at any laiki with organic produce. And also, at any organic food store. In Athens at least. I myself am baking the dish as we speak, with spinach and it smells wonderful! Thank you Mika! What is kale called in Greek? BTW the dish was really delicious! I am thinking of using the sauce for other gratins as well and even for mac’n’cheese! Did you use metric measurements or convert them to imperial? I made this today. It was soooooo delicious! I did change the recipe though. Instead of nuts I used a can of cannellini beans. I’m limiting my fat intake so when I want to use ansubstitute for nuts I use beans. I used a whole can. I was only going to use a cup but I didn’t feel like finding a storage dish for the rest of the beans. They turned out great so I think I’ll keep using the whole can. (14 oz.) I also ground my own fresh nutmeg. It was so good I couldn’t stop eating. My husband liked it too. ps I used cashew nuts not almonds. I made this dish yesterday (and had the rest today) and it was absolutely delicious! 🙂 Thank you so much for this simple and healthy idea! It is so creamy and hearty! No nutritional yeast? Do you think that would be nice for some extra flavor? Anja I can’t for the life of me understand why this has a four star rating. There is only one bad thing about this dish, the cleanup! I loved it so good thank you for sharing this quick delicious recipe. I’m in the us and I don’t understand some of the measurements when I switch to imperial. Made this recipe last night, used Spinach instead of kale. Recipe is so tasty and creamy that we are going to make this dish again. Even my meat eating brother liked it. Great recipe! Just made this for the second time! The sauce is amazing! I didn’t have any miso so just added a little extra tahini. I also added a half of a cauliflower and threw a couple of carrots in! Can you tell me, is the sauce actually of a runny consistencies and then it thickens up a little while baking or is yours quite smooth and thicker when you have finished blending it? I love your recipes! I’ve been vegan for 14 months now and there’s no turning back! So glad you are enjoying the recipe. The sauce gets thicker as it cooks. Hi Anja, Greetings from the USA, more specifically upstate New York. See, your wonderful recipes reach us all over the world. I just want to say that I enjoy your channel tremendously and the way you present all your recipes. Congratulations to you on your health journey and your magnificent transformation!! Thanks so much for putting your information out there!